Did you know that between 1937 and 1996, $15 billion worth of diamonds were exported and sold from Sierra Leone, yet more than half the people of Sierra Leone live on about 30 cents a day? Uhuru Solidarity Movement is hosting a community event to address the conditions faced by African people in Sierra Leone and throughout the world whose resources are stolen and exploited by foreign powers. The event will be held on March 20th, 6:30pm, Thursday at 1245 18th Ave S, St. Petersburg, FL and broadcast live on UhuruNews.com. “The legacy of the diamond is steeped in slavery, colonialism, genocide and terror that built and maintains the Western capitalist system. We are the beneficiaries of this genocidal system,” wrote APSC Chairwoman Penny Hess. 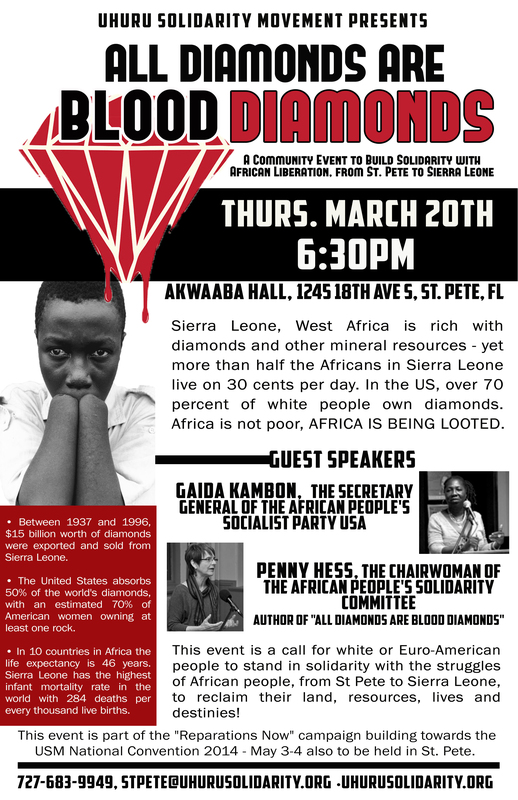 “All Diamonds Are Blood Diamonds” will address how Euro-American people can stand in solidarity with the struggles of African people, from St Pete to Sierra Leone, to reclaim their land, resources, lives and destinies. This event is part of the “Reparations Now” campaign building towards the USM National Convention 2014 – May 3-4 also to be held in St. Pete. Colonialism is killing the environment! Reparations now! Art for Reparations: “Ask Me About the Burning Spear” patch!